Depending on the amount of data available, different analysis methods can be employed. A feasibility study can be carried out based on available wind data in that area. WAsP can be used from coastal meteorological stations to give a prediction offshore, which is aided by its latest tool, the coastal discontinuity model, CDM. (see 'Offshore wind resource assessment in EuropeanSeas, state-of-the-art' in Sempreviva, et al. 2003). Existing offshore measurements can also be used. There are problems associated with using long-distance modelling, especially around the coast due to the differences in predominant driving forces between onshore and offshore breezes and the variation in the coastal zone in between. For a more detailed analysis, measurements offshore at the site are necessary. measure Correlate Predict (MCP) methods from a mast offshore to an onshore reference station can be used. With several measurement heights and attention to measurement, more accurate modelling of the boundary layer will help extrapolate to heights above the monitoring mast. 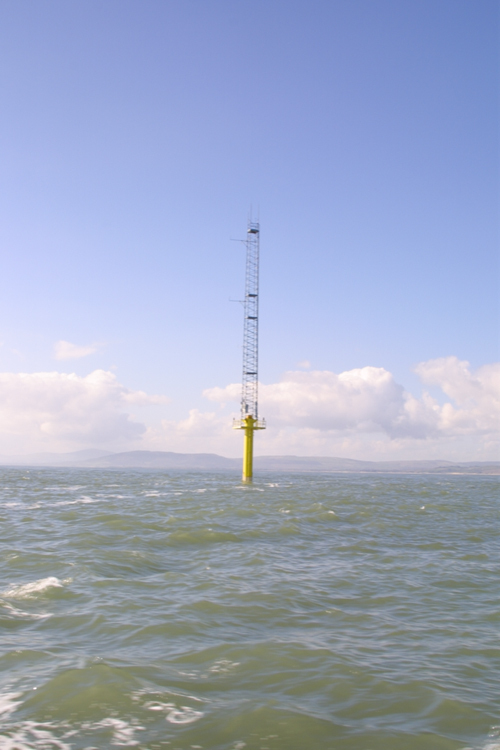 A photograph of an offshore mast is presented in Figure I.5.2.